It's no secret that women's bodies change over the years thanks to the realities of life: weight gain or loss, stress, hormones, childbirth. So it's puzzling why so many of us still opt for a tailored, fitted style when it comes to investing in a quality winter coat. (I include myself in this category: this winter I realized that my much loved Soia & Kyo coat was a little too snug for comfort.) Why pay so much for a staple that might not even fit the year after next? 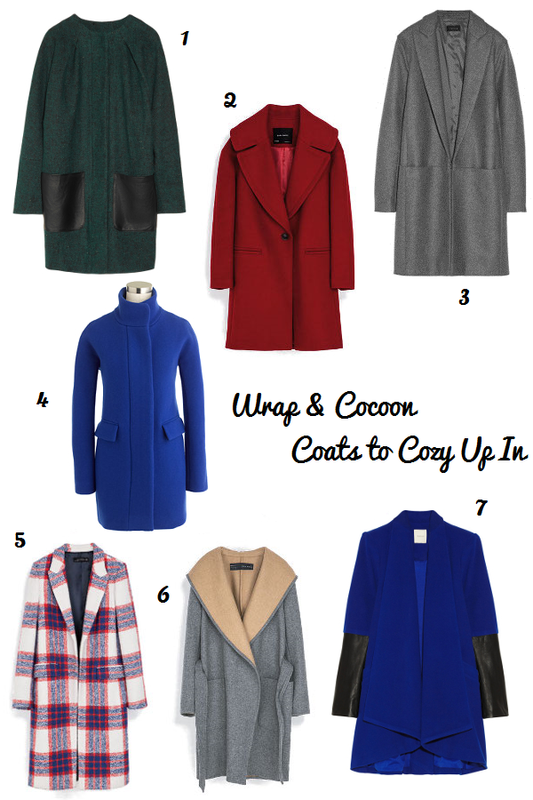 That's why I'm advocating wrap and cocoon styles for your next big coat splurge. Not only are the slouchy, oversize silhouettes trending right now, they tend to be more forgiving as the waist and hips fluctuate over seasons. Plus, they accommodate artful layers and chunky sweaters so much better than slimmer cuts, and depending on the style, can be cinched with a wide belt for a fitted look. When shopping, look for a coat that fits well at the shoulders; the rest is downhill from there. Are you ready to try on one of these coats for size? I love the leather pockets on no.1 and no.7 is so beautiful too! Aren't they?! Those are actually leather sleeves on coat 7. I love cocoon styles, but have yet to buy one. The #6 zara coat is gorgeous!! It's so similar to a leather-trimmed black Cynthia Rowley coat the boy's sister-in-law has.